Dr. Mezuk visited her alma mater, the Department of Mental Health at JHSPH, to give a talk on “Depression and diabetes: From epidemiology to mechanisms.” Here she is with two of her mentors, Drs. Joe Gallo and Bill Eaton. In March 2019, two of our GREMAPers Jacinda and Viktoryia attended an annual meeting for the American Psychosomatic Society, which took place in Vancouver, BC this year. They presented a poster featuring baseline data from the Richmond Stress and Sugar Study. The poster focused on comparing whether HPA-axis reactivity to the Trier Social Stress Test differed by race/ethnicity and/or neighborhood socio-economic status (SES). Findings are intriguing and provide preliminary evidence that exposure to environmental stress, which is operationalized through low neighborhood SES, might alter reactivity to acute stress. Stay tuned for further details! We completed fieldwork for the Richmond Stress and Sugar Study (RSASS) in December 2018 and are actively analyzing the wealth of data we collected in this study. Our preliminary analyses indicate that our primary hypothesis is supported: adults who live in poorer neighborhoods have blunted hypothalamic pituitary adrenal (HPA)-axis stress reactivity (i.e., higher intercept pre-stress, shallower slopes before and after stress) than those who live in wealthier neighborhoods, regardless of race. Future analysis will test whether this blunted reactivity explains why people in poorer neighborhoods are more likely to develop type 2 diabetes. We presented early findings from RSASS at the International Conference on Social Stress Research in Athens, Greece in June 2018, and we are presenting on the complete cohort at the American Psychosomatic Society conference in March 2019 in Vancouver, Canada. We are drafting manuscripts peer review which will be submitted in the coming months. Beyond these gains in scientific knowledge, RSASS served as a training vehicle for over a half-dozen undergraduate, graduate, and medical students. Over a half-dozen undergraduate, graduate, and medical students contributed to RSASS as research assistants; many of these students were from under-represented minority groups. One of our trainees, McKenzie Stokes, was co-supported by an American Diabetes Association Minority Undergraduate Internship supplement; she is now a doctoral student at North Carolina State University. Another trainee, Josh Montgomery, is now a fellow with the Department of Health and Human Services ORISE Fellowship in the Office of the US Surgeon General in Washington, DC. All students learned invaluable lessons from the hands-on research experience they gained from working on this project. Finally, RSASS is part of our ongoing partnership with the YMCA of Greater Richmond around their diabetes programs (prevention and control). We recently completed an evaluation of their diabetes self-management program (funded in part by a grant from the VCU Council on Community Engagement). A jointly-authored manuscript describing the results from this evaluation were published in The Diabetes Educator and these findings were also disseminated to the local community using factsheets and via our Community Advisory Board (CAB). The CAB which provides feedback on how to build community-engaged research capacity on diabetes in the Richmond area. 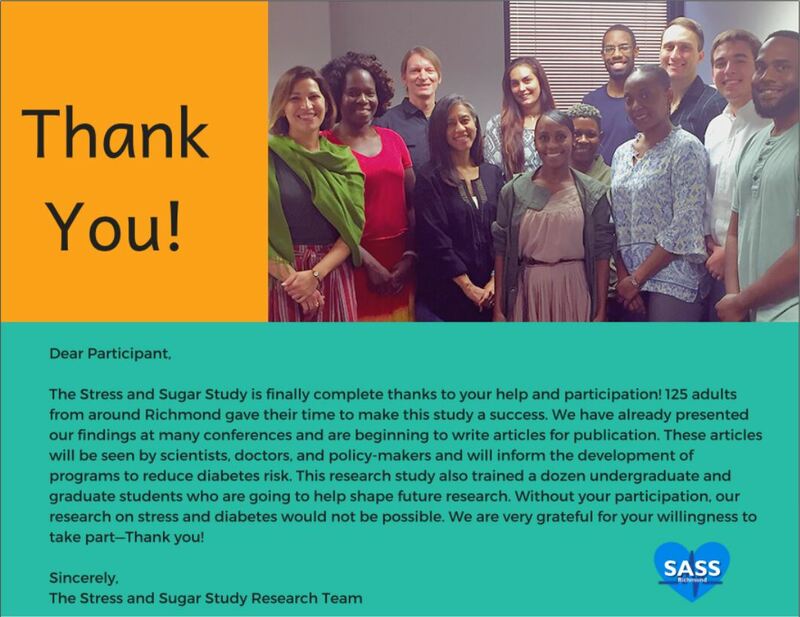 Thank you to everyone who participated in the Richmond Stress and Sugar Study – this research would not be possible without you! Dr. Mezuk co-presented on our community-engaged research partnership to address diabetes disparities with YMCA partner Jana Smith at the Community Integrated Healthcare conference in December 2018. Also pictured is Catlin Hodge, who also used to work with the YMCA diabetes programs! The National Institutes of Health has awarded a grant renewal for the Michigan Center for Urban African American Aging Research (MCUAAAR). The MCUAAAR is a collaboration between researchers at several Michigan universities, and includes several members of the Institute for Social Research at the University of Michigan. The focus of this collaboration is to study health in aging African Americans, including examination of disparities in health outcomes such as diabetes and heart disease. GREMAP student Ashley Rapp organized a menstrual product donation drive with the Detroit chapter of I Support The Girls (ISTG). Local news outlet The Chaldean News has published an article and interview about her work on this project. In October, Dr. Bergmans presented at the National Network of Depression Centers 10th Annual Conference in Baltimore, MD. Dr. Bergmans‘ poster, titled Depression, food insecurity and diabetic morbidity: Evidence from the Health and Retirement Study, examined mediation of the association between food insecurity and depression by diabetic morbidity among older adults with diabetes. Results indicate food insecurity is associated with odds of depression two years later and that this relationship is largely attributable to diabetic morbidity–including kidney problems and poor control of diabetes. Findings may inform development of integrated and/or collaborative treatment strategies that alleviate psychosocial distress associated with diabetes management.